Diamond Jewelry Atlanta | Looking for diamond jewelry in Atlanta? Diamond Rings, Diamond Bracelets, Diamond Necklaces, Diamond Pendants, Diamond Earrings, and much, much more at The Ross Jewelry Company in Atlanta, Georgia. Diamond Jewelry excites women in Atlanta just as it does women around the world. Atlanta Diamond Jewelry | The Ross Jewelry Company is pleased to present a few of the world class diamond jewelry pieces we offer at our Buckhead showroom boutique in Atlanta, Georgia. Diamond Jewelry in Atlanta | Diamond rings or any other piece of diamond jewelry . . . if you are unable to find exactly what you want in any of our diamond jewelry collections, please contact us. We will help you design your own magnificent jewelry piece . . . in your price range. 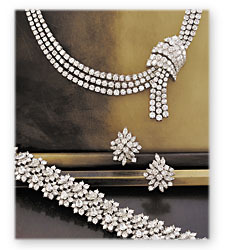 Then, one of our Master Jewelers will artfully craft it to life with great care . . . as if it were to be his own personal gift. We have beautiful pieces available from both nationally and internationally famous manufacturers and diamond jewelry designers. You are invited to inquire about your favorite diamond and precious gemstone jewelry designer. Atlanta Diamond Jewelry Dealers | We can help you find or create any piece of Diamond Jewelry you may need. Diamond Bracelets, Diamond Necklaces, Diamond Pendants, Diamond Earrings, and Unique Diamond Rings are among just a few of the pieces we can create. Your imagination is the only limit to what we can create when you shop with us. Please call with any questions you have regarding our custom jewelry design services or diamond jewelry in general.